Home/Beverage, Blog/Vino Value is Back on January 25 – 25 wines that retail for under $25! 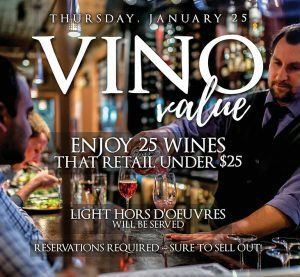 Our popular – and one of our favorite annual events, too – Vino Value is back on January 25, 6 to 9 p.m.
For $25 per person, you’ll enjoy 25 wines that retail for under $25. Light hors d’oeuvres will also be served. Reservations required by calling (734) 222-9841. Note: Tax and flat $6 gratuity not included in the $25 admission.